rotl is an R package to interact with the Open Tree of Life data APIs. It was initially developed as part of the NESCENT/OpenTree/Arbor hackathon. Client libraries to interact with the Open Tree of Life API also exists for Python and Ruby. If you want to test the development version, you first need to install the remotes package. Start by checking out the "How to use rotl?" by typing: vignette("how-to-use-rotl", package="rotl") after installing the package. Then explore how you can use rotl with other packages to combine your data with trees from the Open Tree of Life project by typing: vignette("data_mashups", package="rotl"). The vignette "Using the Open Tree Synthesis in a comparative analsysis" demonstrates how you can reproduce an analysis of a published paper by downloading the tree they used, and data from the supplementary material: vignette("meta-analysis", package="rotl"). The vignettes are also available from CRAN: How to use rotl?, Data mashups, and Using the Open Tree synthesis in a comparative analysis. Starting with v3.0.0 of the package, the major and minor version numbers (the first 2 digits of the version number) will be matched to those of the API. The patch number (the 3rd digit of the version number) will be used to reflect bug fixes and other changes that are independent from changes to the API. Minor update to vignette to address change to TNRS endpoint (underscores can't be included in the taxon names anymore). Minor update to address warnings seen on CRAN. The data types in the data frame returned by tnrs_match_names are consistent, and remain the same even after using update(). Small internal changes that reflect changes in the data structures returned by the API. A warning is issued when users attempt to use TNRS on duplicated names. Fix typos and workaround broken API to retrieve supplementary materials in vignette. The new function is_in_tree takes a list of OTT ids (i.e., the output of ott_id()), and returns a vector of logical indiicating whether they are included in the synthetic tree (workaround #31). citation("rotl") now includes the reference to the Open Tree of Life publication. Add section in vignette "How to use rotl?" about how to get the higher taxonomy from a given taxon. rotl now interacts with v3.0 of the Open Tree of Life APIs. The documentation has been updated to reflect the associated changes. More information about the v3.0 of the Open Tree of Life APIs can be found on their wiki. New methods: tax_sources, is_suppressed, tax_rank, unique_name, name, ott_id, for objects returned by tnrs_match_names(), taxonomy_taxon_info(), taxonomy_taxon_mrca(), tol_node_info(), tol_about(), and tol_mrca(). Each of these methods have their own class. New method tax_lineage() to extract the higher taxonomy from an object returned by taxonomy_taxon_info() (initally suggested by Matt Pennell, #57). New method tol_lineage() to extract the nodes towards the root of the tree. New print methods for tol_node_info() and tol_mrca(). New functions study_external_IDs() and taxon_external_IDs() that return the external identifiers for a study and associated trees (e.g., DOI, TreeBase ID); and the identifiers of taxon names in taxonomic databases. The vignette "Data mashup" includes an example on how to use it. The function strip_ott_id() gains the argument remove_underscores to remove underscores from tips in trees returned by OTL. Rename method ott_taxon_name() to tax_name() for consistency. Rename method synth_sources() and study_list() to source_list(). Refactor how result of query is checked and parsed (invisible to the user). Fix bug in studies_find_studies(), the arguments verbose and exact were ignored. The print method for tnrs_context() duplicated some names. inspect(), update() and synonyms() methods for tnrs_match_names() did not work if the query included unmatched taxa. Improve warning and format of the result if one of the taxa requested doesn't match anything tnrs_match_names. 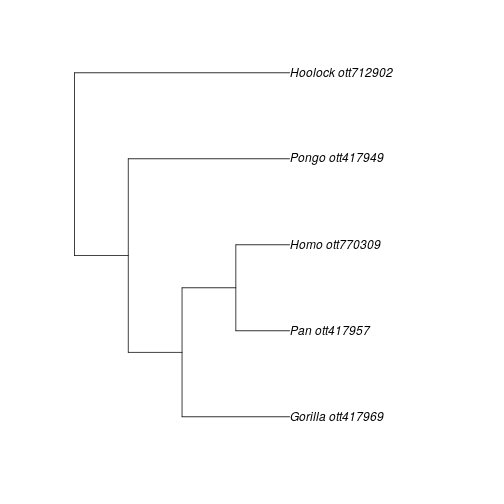 New utility function strip_ott_ids removes OTT id information from a character vector, making it easier to match tip labels in trees returned by tol_induced_subtree to taxonomic names in other data sources. This function can also remove underscores from the taxon names. New method list_trees returns a list of tree ids associated with studies. The function takes the output of studies_find_studies or studies_find_trees. studies_find_studies and studies_find_trees gain argument detailed (default set to TRUE), that produces a data frame summarizing information (title of the study, year of publication, DOI, ids of associated trees, ...) about the studies matching the search criteria. New method get_study_year for objects of class study_meta that returns the year of publication of the study.